This post is my contribution to the PAIL monthly theme post. So here we are, it’s July and I’ve just finished up breastfeeding Matthew so that we can move onto TTC #2 with fertility treatments. Yay. 😉 I am a little irritated that Matthew and I have to give up something that we both love just to try something. There are no guarantees that it will work any time soon – and there is a part of my brain that is angry that we had to stop nursing just to attempt something that only has a 40% success rate. But I need to get over it – because it is what it is. I am ambivalent about TTC #2 (if you can’t tell!). Working on #1 was very hard on me – it took 1 full year of trying naturally, then 2 IUI’s (both BFN’s), then a fresh IVF cycle (BFN), then a frozen cycle (very early miscarriage), and then another fresh IVF cycle (Matthew!). From starting the TTC process to a successful ultrasound, it took us over 2.25 years. 2.25 years. God, I hope it doesn’t take that long again! For me, ideal child spacing would be about 3 years, but we don’t have that luxury. I am 36, Matthew is very social and really needs a sibling ASAP, and… we have 7 embryos in the freezer. We want to give them all a chance if we can, which means that we could be looking at TTC #3 if all goes well with #2 and we have a couple of embryos left over again. In other words, we need to GET ON IT! If I had my way, I would wait a little longer so that Matthew and I could have a little more “us time,” but I do forget that getting pregnant doesn’t yield us a baby for at least 8-9 months so there’s still plenty of “us time” ahead of us. AND – the only reason I say that 3 years is ideal is because my little sister is 3 years younger than me and we are true besties – she was my very first love and always will be. Maybe 2 years spacing would be ideal for my babies and that’s all that really matters. And then there’s this… given what it takes for us to get pregnant, maybe my babies will end up being 3 years apart anyway. We just never know. And that’s the whole point of all of this, right? We just don’t know what’s going to happen and we need to trust fate and just jump in feet first! But… I do know that both my head and heart are ready to get started again. We definitely want another baby (or two!) and we know that Matthew wants a little friend, so it’s time to make this happen. I have no doubts that it will work, but the question is how long it will take and what all it will take. Our RE has different ideas of what we’ll do if the first FET fails (he wants to do a fresh cycle, I’d like to try another FET… but he’s right – my age is an issue), so at this point, I just want it to work the first time so that I don’t have to make hard decisions. That would be nice. However, that would not be likely. I do know that I will not allow myself to be as stressed out about this as I was when we were trying desperately to get Matthew. We have one baby already and that is all we need – we are complete with him. I have written about this several times – I feel it deep down in my soul that Matthew completed our family for us. Every baby after him is an extra cherry on top of our sundae (and I love cherries!)! We are no longer looking at being childless, so that makes TTC #2 way easier on an emotional level. Sure, I’ll throw my heart and soul into it, but I have a little boy who warms my heart and completes my soul. He gives me strength. He gives me happiness. He gives me peace. I will kindly take those gifts from him and use them to make this process easier on us ALL (B included). I assure you, and myself, of that. Categories: Bryson, Infertility, PAIL | Permalink. I am happy to hear that your perspective is starting to shift – that your heart is following your head as it were. This is always the hardest thing to do. I am so inspired by your positive, yet realistic attitude. It lifts my heart to read how M bolsters you, completes you. I know that when it gets closer, it might shift again too – and that is totally understandable, and totally okay. These words are always here for you. It’s going to be good, no matter what. What a beautiful photo! I really like this quote: “We are no longer looking at being childless, so that makes TTC #2 way easier on an emotional level.” Great perspective! Thank you! That was taken after I let him play in the rain on the deck. He was upset that it was time to go in. He likes being wet! I am so at peace with only having one child if that’s what we’re meant to have. 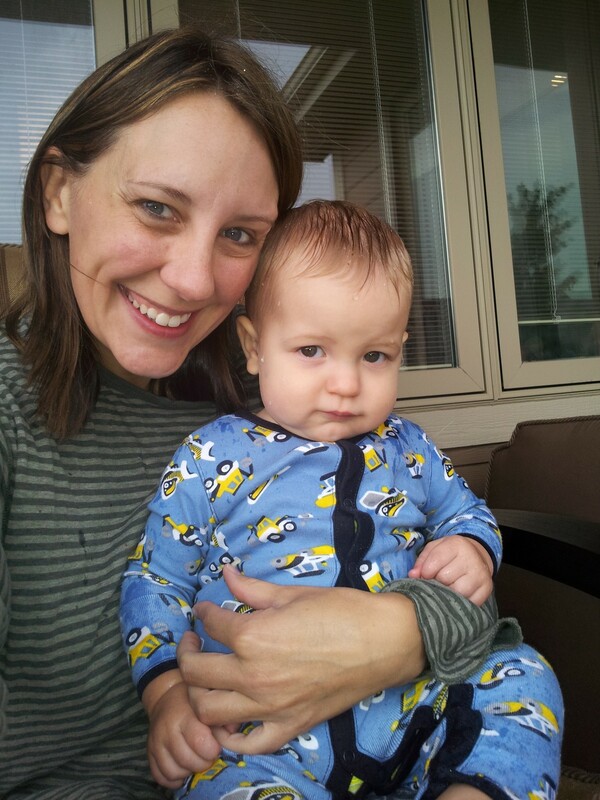 I would love more, but man – I just love this little boy! Very much like your little frog prince. That post of yours made me cry! I love the last paragraph, that pretty much sums up how I’m feeling too. I hope that TTC #2 doesn’t take anywhere close to 2.25 years and you will be giving Matthew a sibling before you know it! Either way, I’ll be following along as your cheerleader! By the way, we had pictures taken on Sunday and used your cake topper! I can’t wait to see how they turned out!! Thanks again! I will love having you as a cheerleader! And I will be yours, whenever you need one! I cannot wait to see Chloe’s photos. She is too cute!!!!! I hope that TTC#2 is much easier for you than it was the first time. I hoped that would be the case for me but it hasn’t been, at least not as much as I would like. It probably is MUCH easier and I just forget, to some degree, how incredibly difficult the first time was. I definitely don’t have that heavy weighted fear of “what if it never works” hanging over me and that is truly wonderful to live without. I hope TTC#2 and 3 go well! It’s great you’re both on the same page about everything. That can be half the battle. Here from PAIL. I’m in almost the exact same boat you are. We have 5 frozen tots and want to give them all a chance. I’m a little older than you and my baby is a little younger than yours…so perfect spacing isn’t an option for me…but like you said my kids will be perfectly spaced for our family. Yes…exactly…I couldn’t have said it better! I also stopped breastfeeding my son to jump back into TTC and I felt (feel) horrible about it. I still question the decision, he was still loving it, but if I wanted any hope at #2 I really felt like I had to get a move on. We are planning to start treatments in September and doing testing now. it’s so weird to be back. Wishing you luck on your FET when you get there! Good luck to you too! If I ever get my first post-nursing period, we will be cycling together. I think a lot of gals are looking at September as a start date.